This site has been a sacred site since ancient Roman times in Spain. It was a Roman Temple to the goddess Janus who was the double headed goddess. Next it was converted to a Christian church dedicated to St. Vincent in 500 CE. The next historical step is when it became a mosque in 785 when the Moors conquered Spain. In the 15 C a cathedral was built in the middle of the mosque on the very spot where St. Vincent, the early Christian Church was standing. If you are interested in sacred architecture, please do take a few minutes to watch the video taken by a walker of the church inside the mosque! You won’t be disappointed! Córdoba was the capital of the Spanish Muslim dynasty of the Ummayads (756-1031). 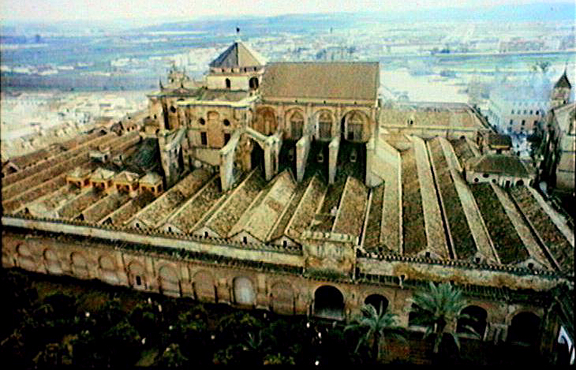 The Great Mosque of Córdoba (La Mezquita) was founded 785 CE. It was added to and expanded over the next two hundred years to make it the third largest structure in the Islamic world. The prayer hall (23,400 square meters) is filled with almost 500 hundred slender columns and superimposed striped arches; a forest sprouting from the marble floor. Previously the site had been occupied by a Christian church dedicated to Saint Vincent that had been built by the Visigoths around 500 CE. Before that, when Córdoba was a provincial capital in the Roman Empire, the site was occupied by a temple dedicated to Janus, the double-headed god of doorways and gates. 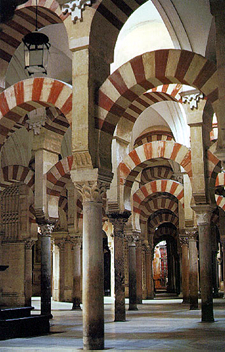 When Córdoba was captured by the Christian Spanish king of Castile, Ferdinand III, in the 13th century, the mosque reverted to a Christian sanctuary. 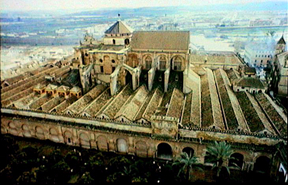 Then in 1523, the local clergy, with the support of Emperor Charles V, built a cathedral in the middle of the mosque (see panoramic view of the city of Córdoba with the mosque and cathedral). David Gilmour, Cities of Spain, London: John Murray, 1992. The only other similar sacred place that I have heard of is the Temple Mount in Jerusalem which we hear in the news. It, too, has long and varied use as sacred architecture for Judaism, Greco-Roman paganism, Christianity, and Islam. If you know of other similar historic places, please let me know. This is an amazing historical site of faith, pain, and prayer. It is a place I will never forget. This entry was posted in Architecture, Religions of the World, Travel, Uncategorized and tagged cathedral, Christianity, church, columns, Cordaba Spain, Islam, Janus, mosque, Prayer Hall, Religions of the World, Roman Pagans, sacred architecture. Bookmark the permalink.